Carlton Hotel is a luxurious property which features a gym. Free Wi-Fi is available in its lobby and restaurants. Luxurious and stylish, rooms are located over 3 wings and offer different views of the city. Each is equipped with a cable TV, minibar and ironing facilities. Tea/coffee making facilities are also included. En suite bathrooms have a bathtub . 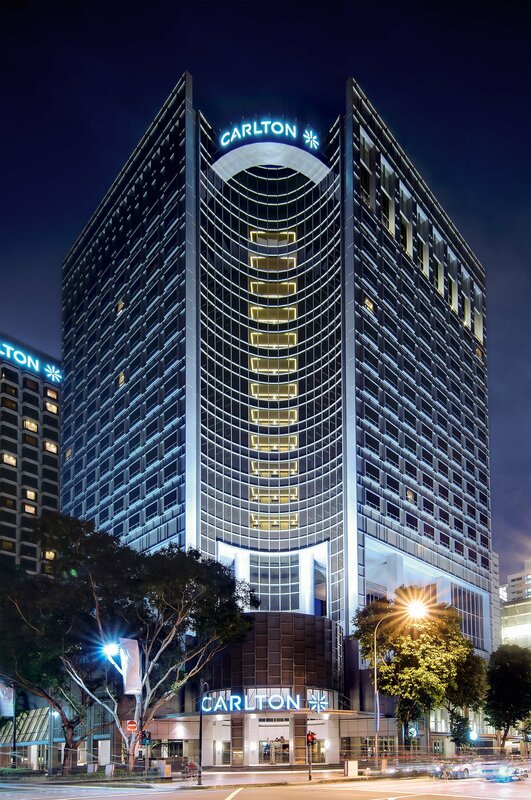 Centrally located along Bras Basah Road, Carlton Hotel Singapore is a short 5-minute walk from City Hall MRT Station and Raffles City Shopping Centre. It is a 20-minute drive from Changi International Airport. Guests can enjoy a relaxing massage or facial at the spa. A business centre lets guests check their emails while newspapers are available at the 24-hour front desk. The hotel also provides laundry and dry cleaning services. Cafe Mosaic serves a delicious buffet spread of International cuisines. The award-winning Wah Lok Restaurant offers fine Cantonese dishes. After-dinner drinks can be enjoyed at Gravity Bar, which features live music at night. Tuxedo is a Cafe and Patisserie with a fine selection of freshly baked cakes and pastries, along with hand-pulled Italian coffee. City Hall is a great choice for travellers interested in shopping, food and sightseeing. Merlion Park - just 1,000 m away. A well known icon of Singapore, it's worth visiting even if only for the likes your photos of the beautifully sculptured fountain will get on social media!